BERLIN, GERMANY - NOV 23, 2018: Pink flamingos in Berlin zoo. Jungle Animals set near a stream. 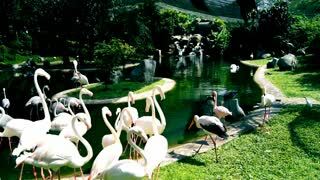 Flamingos, zoo, visit, nature, animal, bird.